Despite the oil shock, Saudi Aramco, the world’s largest oil exporter, has pledged to spend $35 billion over the next five years in oil exploration and production (E&P) as part of an effort to maintain capacity, while its investments in the downstream sector might be more than $100 billion over the coming decade as the global oil demand increases 25 per cent in the coming 25 years. But analysts feel state-owned Saudi Aramco is becoming more sensitive to movements in international oil prices, which will have sharp effects on spending. In May, the government’s Council for Economic and Development Affairs approved Aramco’s restructure, with a clear separation of the company from the Ministry of Petroleum and Mineral Resources to which it was previously closely aligned. The king appointed Khalid Al Falih as chairman of Saudi Aramco and health minister. Amin Al Nasser, Saudi Aramco senior vice-president, has been named acting president and CEO of the oil giant to succeed Al Falih. 'We view Saudi Aramco’s restructuring as a step towards making it a more commercially-driven organisation with increased independence in financial matters,' Jadwa Investment says in a research note. Whereas Aramco had previously taken orders from the petroleum ministry, it will now be overseen by a 10-member Supreme Council for Saudi Aramco, headed by Mohammed bin Salman, the son of King Salman. Some analysts see the move as likely to result in better governance of Aramco, as its management seeks to trim costs and improve operational efficiency. But the restructure also means Aramco will become more sensitive to movements in oil prices, with forecast prolonged periods of lower prices affecting spending more sharply, 'much like other international oil companies,' it says. 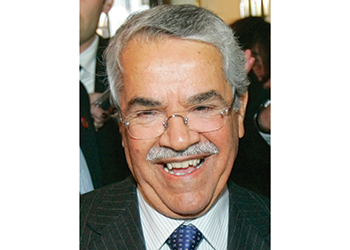 However, oil minister Ali Al Naimi says: 'When prices began to fluctuate, the kingdom’s financial strength, world-leading oil production capacity, and patient, long-term outlook gave confidence to both consumers and producers of energy. 'Saudi Aramco also played a vital role in supporting the national strategy for energy efficiency by promoting wiser energy use and by exploring alternative and renewable energy resources to diversify the kingdom’s energy mix. Saudi Aramco again proved a leader in discovering and capturing greater value from our hydrocarbon resources. Company researchers are generating new ways of making petroleum more accessible, sustainable, and beneficial. Strategic investments in innovative energy technology startup companies around the world will spur development of the kingdom’s energy services sector,' he says. The state-owned oil giant has spent the last five years spending heavily on infrastructure, particularly in downstream, with investments in three new refineries. Aramco said in its 2014 Annual Review that it will continue to invest significant sums over the next decade, but with a greater emphasis on upstream as it seeks to maintain a crude oil production capacity of 12 million barrels per day (mbpd) – to reinforce its position as the world’s 'pre-eminent' producer and supplier – along with developing 5 billion standard cubic feet per day (bscfd) of new non-associated gas processing capacity for domestic consumption. Aramco’s 2014 crude exports totalled 2.5 billion barrels (6.85 mbpd). Jadwa’s comments were part of a wider analysis of the impact of lower oil prices on the Saudi Stock Exchange, known as the Tadawul. Being a predominantly oil-based economy, it seems obvious that major changes in the oil price will be followed by changes in the stock market. 'While sentimental changes often impact the stock market immediately, real changes will take effect over the longer term. If oil prices remain low, this ultimately affects economic policy framework, private sector activity and corporate profitability,' Jadwa says. Investor fears of a Saudi government slowdown in spending as prices fell in the second half of 2014 were allayed by an expansionary fiscal policy at the end of the year and the stock exchange has recovered. This has been helped by the smooth succession to the throne by King Salman in January, and stabilising oil prices. Saudi Aramco, an integrated oil natural gas and chemicals company, company is active in each and every facet of oil and gas value chain from upstream to downstream. Strong focus on expanding reserves coupled with efficient refining network has strengthened the company’s business operations. Increasing demand for petroleum products, and strategic investments could provide the company with various new growth opportunities. However, volatility in oil and gas prices and exploration and development risks could affect its operations, analysts say. Presence in the world’s second largest oil reserve zone gives Aramco an advantage over its peers. Saudi Aramco has substantial focus on strengthening its oil and gas reserve holding though enhanced exploration and development activities. As of December 2014, the company’s oil reserves stood at 261.1 billion barrels. The reserve addition was due to oil and gas fields’ discovery during 2013. In FY2014, the company discovered five gas fields, namely, Abu Ali, Faras, Amjad, Badi, and Faris; two oil fields, Sadawi and Naqa; and one oil and gas field, Qadqad. It also completed several offshore wells in the Red Sea. As of December 2014, the company’s proved gas reserves stood at 294 trillion standard cubic feet (tscf) as compared to 288.4 tscf in 2013. Market leading operations have strengthened the company’s competitive position in the global oil and gas industry. In FY2014, though oil markets went through a tough phase, Saudi Armco did not cut its output to prop up oil markets. However, the company, like other oil-producing countries and publicly listed energy companies, witnessed the ill effects of weak markets and increasing costs. It plans to capture better deals on oil-well services as well as negotiate discounts on its phone and power bills. 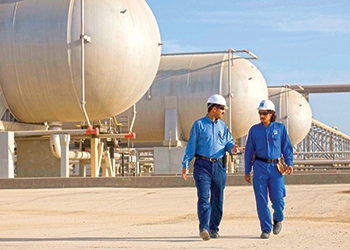 Meanwhile, crowning a landmark year (2014) for Saudi Aramco, its more than 61,000 men and women – the largest workforce in the company’s history – achieved remarkable progress on the journey to transform the company into the world’s leading integrated energy and chemicals enterprise, the company’s 2014 Annual Review says. These achievements include record oil reserves and gas production and major progress toward completing the company’s Wasit Gas Plant and the Sadara Chemical Company, a joint venture with The Dow Chemical Company in Jubail. At every link in the petroleum value chain, the company’s ultimate goal is to safely, sustainably and reliably deliver the energy on which global economies and social progress depend. As the global population grows, economies expand, and standards of living increase, energy will continue to be an essential enabler of opportunity. Saudi Aramco is executing a wide-ranging strategy to ensure that it is at the forefront of providing the needed energy – today and far into the future. 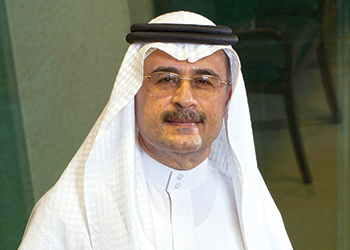 The 2014 Annual Review showcases key achievements across the value chain, including exploration successes in the Unconventional Gas Programme; progress on three gas plants; the expansion of integrated refining and petrochemical capacity with Rabigh Phase II; advancements on the grassroots Jazan Refinery; and the expanding network of global research centres and technology offices. In 2014, Saudi Aramco averaged 9.5 mbpd of crude oil production – roughly one in every eight barrels produced in the world – energising the world economy and enabling the further development of the kingdom’s economy. Raw gas production averaged 11.3 bscfd, an increase of nearly 3 per cent compared to 2013. Growing gas production capacity will help ensure Saudi Aramco efficiently meets the kingdom’s rising energy demand with gas for power and industry while also meeting the global call on the company’s products. The company’s Manifa crude oil increment was approaching full production capacity of 900,000 bpd of Arabian Heavy crude oil at the end of 2014. Manifa also produces associated gas as feedstock for industrial cities to help fuel economic diversification. Two major projects are under way at the Shaybah complex in the Rub Al Khali (the Empty Quarter). First, oil production capacity is being expanded by 250,000 bpd for the second time, bringing the total capacity to 1 mbpd of Arabian Extra Light crude oil by April 2016 – doubling the original capacity of Shaybah when it came online in 1998. Second, during 2014, major construction was 96 per cent complete on the new natural gas liquids (NGL) recovery plant. Natural gas is a critical component of the company’s strategies to help reduce the kingdom’s reliance on liquid fuel for power generation and to provide the foundation for further economic growth and diversification. Year 2014 witnessed major progress in the company’s ability to expand natural gas production with the construction of the Wasit Gas Plant, one of the largest nonassociated gas plants Saudi Aramco has ever built. At full capacity, Wasit’s integrated facilities will process 2.5 bscfd of nonassociated gas from offshore fields. The plant also includes one fractionation module designed to process 240,000 bpd of NGL. The Midyan Gas Plant in the Tabuk region is the company’s first such project in the kingdom’s northwest. Work on the plant commenced in 2013 and the facility is scheduled to be fully operational by the end of 2016. Midyan is designed to produce and process 75 million cubic feet per day (mmcfd) of nonassociated gas and 4,500 bpd of condensate. In its early phase, the Fadhili Gas Plant will process 2.5 bscfd from onshore and offshore fields and is on track to come onstream by 2019. Together, the company’s Wasit, Midyan and Fadhili gas plants will add more than 5 bscfd of nonassociated gas processing capacity, further enabling opportunities in Saudi industries, such as steel, aluminium, and petrochemicals; water desalination plants; electricity production; and downstream value-added industries to produce antifreeze, solvent, fuels, and other advanced materials. Raw hydrocarbons are of little use until they are refined and converted into useable products for consumers. Along every step in this process, the company’s priority is to identify and leverage opportunities to realise additional value. The cumulative effect of the company’s transformation will be a world-leading, fully integrated downstream system that maximises the value of every hydrocarbon molecule and a portfolio that is more robust and resilient to market turbulence. The company’s strategy to more tightly integrate operations across the hydrocarbon value chain has enabled – and will continue to enable – myriad opportunities for people in the kingdom and abroad. In August 2014, Satorp’s crude oil throughput reached the facility’s full design capacity of 400,000 bpd. This new venture will generate approximately 5,700 direct and indirect jobs and represents a major step in achieving the company’s vision of being among the world’s top three refiners and a world-leading manufacturer of chemicals. Yasref, a joint venture with Asia’s largest refiner, Sinopec, began commissioning in late 2014 and delivered its first shipment of clean diesel fuel in mid-January 2015. The refinery produces gasoline and ultralow sulphur diesel, liquefied petroleum gases (LPG), and other products, including benzene, sulphur, and petroleum coke for export. Within a few years of operation, Yasref is expected to generate about 6,000 direct and indirect jobs for the community. The company’s Sadara joint venture started up in the third quarter of 2015 and all process units will be onstream within one year of startup. Sadara is on track to be the first chemical complex located in the countries of the Gulf Cooperation Council (GCC) to use naphtha as part of its feedstock. This advance will lead to new speciality chemicals plants and businesses in the kingdom and open up a new range of downstream opportunities. The impact of Sadara on the kingdom’s economy will be further industrial diversification built on the growth of businesses capable of manufacturing consumer products from these new chemical streams. Sadara will also generate thousands of employment opportunities – both through the complex itself and through PlasChem, its integrated conversion industry park. Through the efforts of the company’s international offices, Saudi Aramco expanded its global refining and chemicals presence in 2014. On July 2, 2014, the company’s Aramco Overseas Company (AOC) subsidiary announced its largest overseas investment to date, agreeing to purchase the Hanjin Group’s entire stake in S-Oil, comprising 31.9 million shares. S-Oil is South Korea’s third largest refiner.